Gourmet Girls Fine Catering has recently spawned the Pronto Truck. A drop of bright yellow sunlight at the base of the Perkins Road Overpass is the new "it girl" on the grab and go lunch scene. Gourmet Girls started the Pronto Truck because people kept trying to go to their storefront for lunch. After the demand began to grow they decided to cook items on a changing lunch menu in the Gourmet Girls kitchen, pack them up, and sell them through the Pronto Truck window. I went on Taco Tuesday and had their pulled chicken tacos. They were quite tasty once put together, but I imagine they would have been even better had they been assembled to order. Having that said, I had been seeing pictures of their good looking salads for days on Instagram and had to pop over and give one of them a try as well. 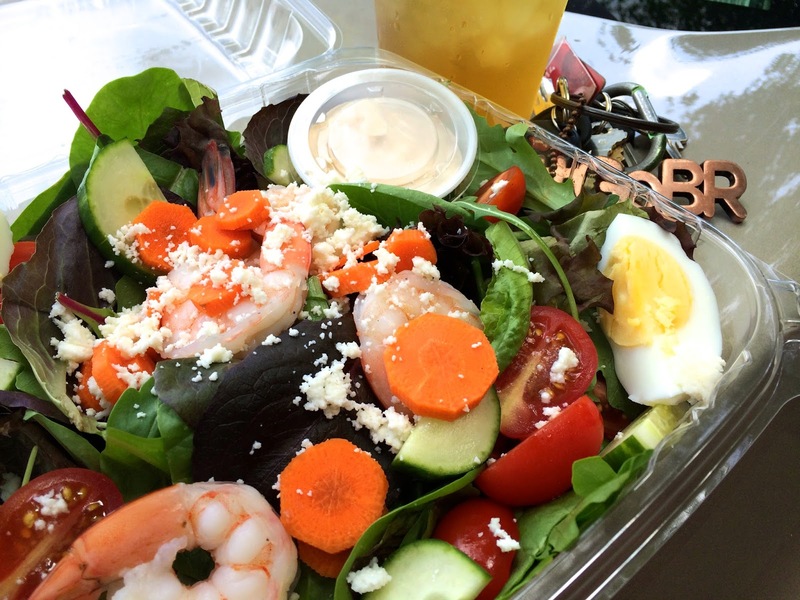 The Baja Shrimp Cobb Salad contained every bit of crispness and deliciousness that I would expect from Gourmet Girls. Lovely boiled shrimp over mixed greens with cucumber, carrots, and tomatoes with a salsa ranch dressing provided a fresh bite on a seriously warm day. I look forward to trying the other salads they come up with.